Trajan was one of Rome’s great emperors, ruling over the Empire from 98 to 117 AD. He was a distinguished army leader, who brought victory in the German provinces, and once emperor he ruled with justice, tolerance and respect. Like many of his predecessors, he was also a great builder, giving the city a grand forum, the biggest ever built, a library and the market bearing his name. Such monuments were so admired that they contributed to his fame as an historical figure. One of his most remembered achievements was the conquest of Dacia (today’s Romania) early in his reign, which extended the Empire’s borders further East to the shore of the Black Sea. His great military victory was recorded on the triumphal column which still stands where his forum had been. The column was an artistic innovation at the time. It was made of 23 superimposed Carrara marble drums of one metre high each and a diametre of about 3.5 metres. Each drum was carved with delicate reliefs telling the story of the lengthy Dacian war. The story starts at the bottom of the column and unravels in a 200 metres spiral all the way to the top. It was the first time a story was told using sculpted reliefs which turned around a column. Usually, columns were decorated with flower garlands at special occasions but never carved. Ordered by the Senate in 113 AD to celebrate the emperor, Trajan’s column was built on a design by Apollodorus of Damascus, his great architect. 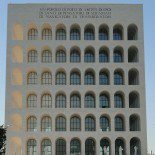 Its 40 metres height is particularly significant because it makes it as tall as the nearby Quirinale hill, suggesting the importance of Trajan’s achievements. In Roman symbolism, the height of a column was proportionate to the person’s worth. In the mid-19th century, when archeology became an organised science, a full cast of the column was made to take copies of the reliefs. 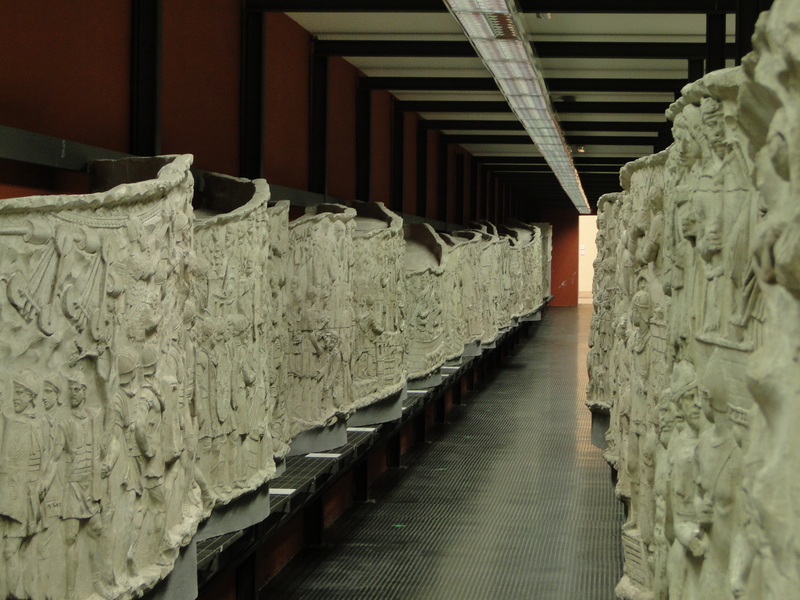 Today, one set of plaster copies can be seen in the Museum of Roman civilisation in the EUR district of Rome. It is probably the best piece in the whole museum. The reliefs are displayed one by one as they appear on the original column, giving viewers the opportunity to follow the story in detail, and appreciate the quality of the sculptures. In some parts the plaster casts are in better condition than the original marble column because they’ve been protected from pollution and weather alterations. The story, made of 2,500 sculpted characters, starts with the Roman army crossing the Danube on a wooden bridge and building camps to prepare for war. Trajan is seen appearing as much as 60 times on the reliefs, as he was actually present on the battlefield throughout the war. The ennemy is depicted wearing unusual costumes, reminiscent of fish scales. The local villages and huts are carved in great detail, as well as the bloody war scenes. The story ends with the death of Decebalus, the dreaded Dacian leader. 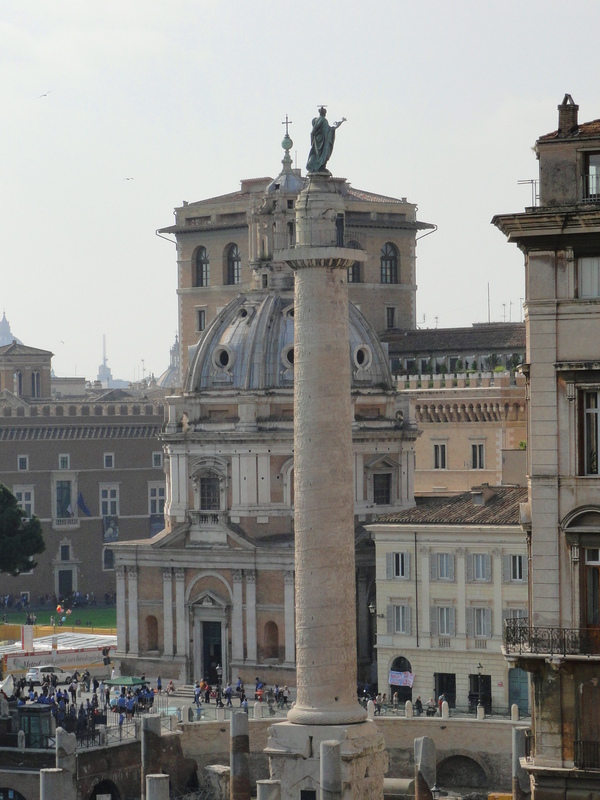 A statue of Trajan used to crown the column, but it was replaced in the 7th century by the one of St Peter’s still there today. 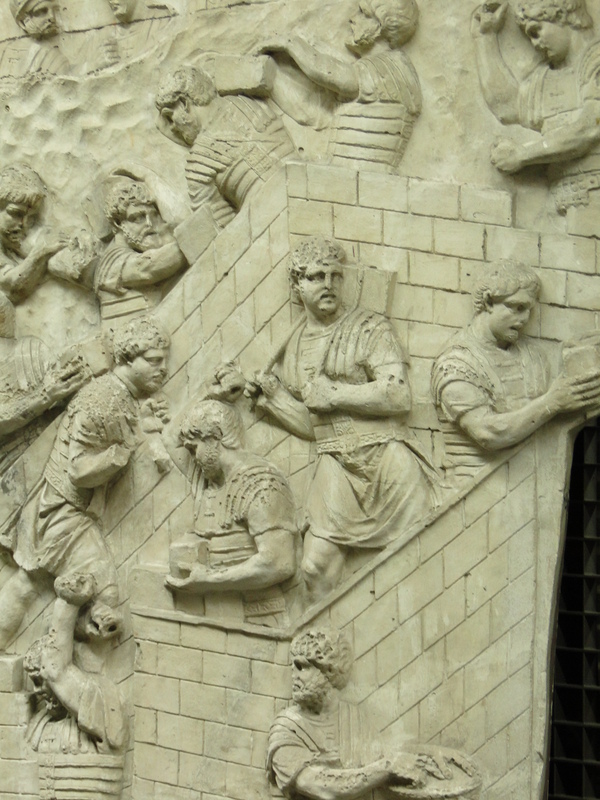 It is believed that Trajan’s statue had been taken to Constantinople at the time. The innovative column inspired many later ones, in particular that of Marcus Aurelius in Piazza Colonna in central Rome. This entry was posted on May 3, 2011 by Salambo in Ancient Rome, Arts and culture and tagged Ancient Rome, EUR, Forum, italy, museum of roman civilisation, Rome, trajan, trajan's column.